Steer; Elmohamady, Mings, Tuanzebe (Jedinak, 73), Taylor; McGinn (Hourihane, 72), Whelan, Grealish ©, Adomah, Abraham (Davis, 60), El Ghazi. Unused subs: Sarkic, Green, Bjarnason, Lansbury. Aston Villa made it a remarkable nine wins on the spin as they defeated Bolton Wanderers 2-0 away. Jack Grealish and Tammy Abraham were the second half goalscorers as the claret and blues bolstered their Play-Off hopes. 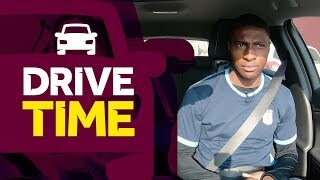 Grealish headed home his sixth of the season on 47 minutes as he scored in successive away games with a bullet header after a perfect cross from the right by Abraham. Abraham pounced 10 minutes later as Grealish turned provider this time with a flick into the striker’s path, who bundled the ball home. The only downside of this ace attacking play was that it was the last action of Abraham, who exited the game holding his shoulder, seemingly hurt in doubling the lead. The first half never really caught fire – although the visitors had chances to go in front. Anwar El Ghazi was inches away from opening the scoring on 13 minutes after a delicious ball in from the right by Grealish. The claret and blues thought they’d found the net three minutes later when John McGinn appealed that his header had crossed the line but referee John Brooks waved it away. It was McGinn again who came closest to breaking the deadlock in stoppage time when his left foot strike on the turn was superbly parried out by Ben Alnwick. Before that, the Trotters did have a chance of their own on 39 minutes but Clayton Donaldson’s strike was pushed out by Jed Steer. 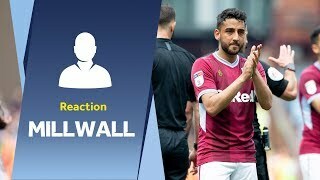 But Smith’s side won the game before the hour mark as they turned on the style after the break, Grealish and Abraham linking up to help each other on to the scoresheet. There were chances to add to the tally in the closing moments, Abraham’s replacement Keinan Davis having the best opportunity but he flashed his shot wide on 82 minutes when well-placed. Aston Villa are now setting their sights on a record-breaking 10 wins in succession. We’ll reach that tally if we can see off Millwall on Easter Monday and, in so doing, reach a claret and blue milestone. We now sit on nine successive victories – the first time we’ve achieved that in 109 years. But if we can tame the lions – which will be a difficult proposition – it will be the first time we’ve ever achieved that. Big congratulations to Tammy Abraham, who’s now made it to 25 league goals in this Championship season. It’s another milestone to be proud of this term. The last player to reach 25 league goals was Andy Gray - 42 years ago! Abraham was forced off shortly after his bagged the second of the afternoon – and we’ll be keeping our fingers crossed that he’s fit enough to resume his formidable form as look to continue the campaign via the Play-Offs. Commiserations to Bolton Wanderers this afternoon – a fellow founder member of the Football League in 1888. While victory helped us take another step towards the Play-Offs, defeat for our hosts consigned them to relegation. 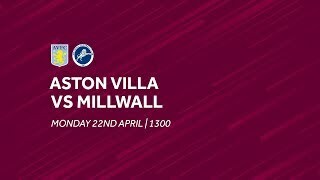 It’s straight back into action for Dean Smith’s men as we face Millwall on Easter Monday. The game in B6 kicks off at 1pm and represents our penultimate game at home in the regular season this term.